Day in and day out, we hear a lot of cases of people contracting varying diseases. But do we know that some of these diseases could possibly be associated with obesity? You may be interested to know that being obese is not the same as being over-weight. So exactly what is obesity then? Obesity is a disease of excess fat storage in the body that leads to a number of associated diseases like cancer, diabetes, heart diseases, and so on. Obesity is a multi-factorial, progressive, life-long, and potentially life-threatening disease. People with a Body Mass Index (BMI) of between 25 and 29.9 are generally categorized as being over-weight, whereas people who have a BMI of 30 or over may be considered as obese. BMI is a measure of body fat that is calculated based on the height and weight of adult men and women. 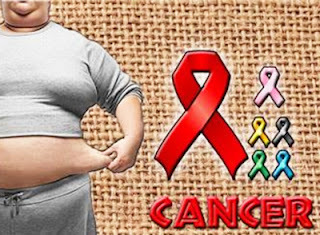 Obesity or excess weight may contribute to cancer risk, and science has the strongest evidence that links obesity with cancer. Obesity causes an imbalance in the functioning of the immune system and levels of certain hormones, irregular cell growth, and imbalance in the levels of proteins that tend to influence how the body uses certain hormones. Mentioned below are the types of cancer that have been associated with obesity. Does weight loss reduce obesity and the risk of cancer? Research and survey reports on how reducing weight will lead to reduced risks of developing cancer are limited, but some studies suggest that weight loss and weight control may lead to the prevention of certain types of cancers like breast cancer and more aggressive forms of prostate cancer. Change in lifestyle behaviors: Keeping a check on what and how much you eat is essential. For a healthy body, it is advisable to eat more vegetables, whole grains, fruits, and soups, and cut down on beverages high in sugar or soda. This, coupled with moderate to intense physical activities and exercises can further reduce the risk of cancer caused by obesity. Medication: Medication or drugs are only to be advised when a combination of behavioral changes like changes in eating habits, mental and behavioral support, and exercising fails to show its results. Doctors generally prescribe drugs to those patients who suffer obesity and have other health issues as well. Surgery: To cure obesity, it is primarily vital to focus on weight loss. Weight loss up to 30% or more can help in lessening the effects of obesity. Weight loss for obesity can be achieved through proper regimes and diet or by undergoing weight loss surgeries, especially for people whose BMI is of 40 or higher. Thus, small changes (like the above) in the everyday routine can bring about meaningful improvement in your daily health and healthcare finances.